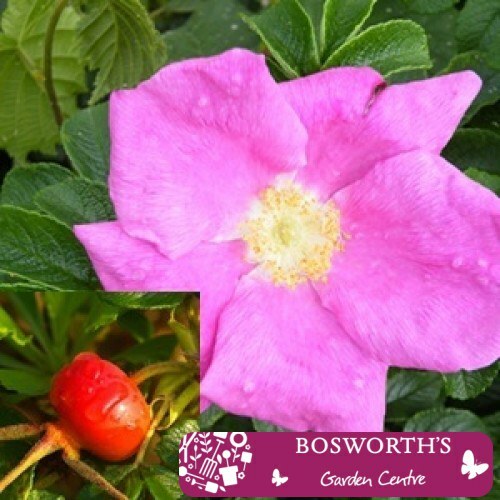 Bare Root Hedging - Rosa Rugosa (Single) - Excellent fast growing & tough deciduous hedge. Produces an abundance of richly scented flowers from June-September which are followed by large orange-red hips in early Autumn (can be as big as a cherry tomato!) which are good for rose-hip syrup, or make excellent bird food. The branches are covered in masses of small bristly thorns so form an excellent protective barrier for security purposes. Rosa Rugosa grows very densely, but in a rambling fashion. Must have free-draining soil but otherwise is not fussy about site.